Personalised Jewellery Boxes create perfect gift-giving moments for girls of all ages! With a white, high-gloss ‘piano finish’, these cute cubed jewellery boxes keep treasured jewels carefully tucked away for any length of time and are a beautiful addition to girly-girl bedrooms everywhere. 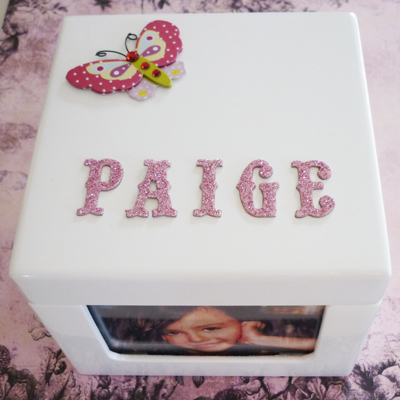 The top of the box is personalised with the name and theme of your choice, plus there are 4 panels on each side of the box to place your own favourite photos or pics. Lined in luxurious cream-coloured flocked velvet, this jewellery box features a lift-out top tray with 4-ring inserts and a deep rectangle necklace and bracelet holder. There is more space underneath for other jewellery, keepsakes and all those treasured little secrets! The outside bottom surface of the box is delicately covered to protect your furniture from scratches. Please Note: Lettering and embellishments will vary depending on stock currently on hand and may differ from those illustrated. Turn-around time: Maximum 5 - 7 days after your payment and order is received. We will notify you on despatch.